This week, the front door to home at 1689 14th Street N.E. is boarded up. Orange fliers are posted all over the house to notify would-be occupants that it has become unsafe. “No trespassing” are in windows. A little over a week ago, that wasn’t the case. 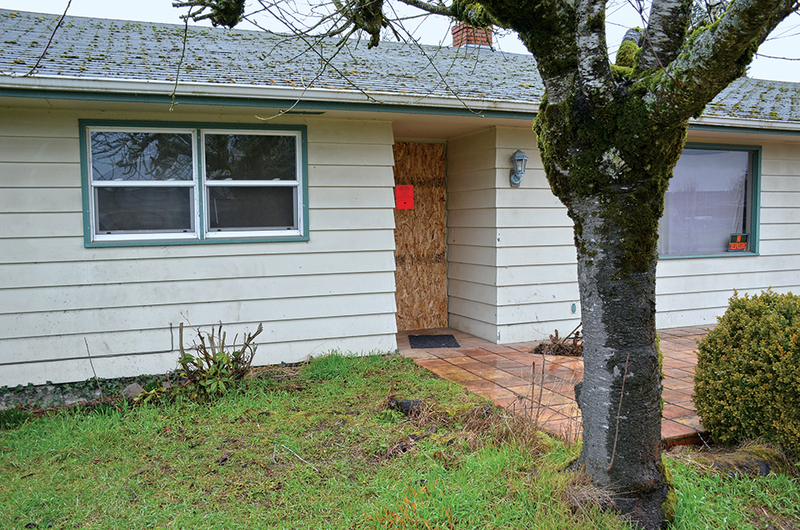 On Wednesday, Feb. 1, Keizer police officers executed a search warrant on the house that resulted in ousting a pair of sisters and their children, among others, who were squatting inside. “Last month, (the Community Response Unit) began receiving complaints from neighbors and patrol officers regarding this house. The complaints described a high volume of foot traffic, noise at night, garbage piling up and suspicious people loitering in and around the location,” said Sgt. Robert Trump. In the process of investigating the situation, police officials learned that the home – which is only several hundred yards south of Gubser Elementary School – was a foreclosure owned by Deutsche Bank. The women who appeared to be the full-time residents – Stephanie Kahler, 37, and Jenny Kahler, 41 – were contacted and interviewed. Police told the women they needed to leave or face arrest, but they remained. In the meantime, KPD enlisted the help of Ben Crosby, the city’s code enforcement officer. Crosby found solid waste violations, a broken down pick-up with expired plates, piles of trash and more. “I also found numerous housing code violations, the big one being a bedroom being built in the garage with no secondary egress or heating. They were using multiple heaters powered by extension cords throughout the house. Other housing violations were: missing outlets, exposed live wires, holes in the drywall and missing smoke detectors,” Crosby said. When police served the search warrant, the Kahlers weren’t the only ones in the home. “Inside and associated with the home, CRU (officers) found methamphetamine and hypodermic needles, and several people with extensive criminal histories were known to associate and/or live inside the home while it was bank-owned,” Trump said. Two juveniles, the 13- and 16-year-old children of the Kahlers, were interviewed by child welfare workers and released to their mothers after they were arrested and released. Three pit bull dogs, several smaller dogs and a cat were released to a relative. The Kahlers were both cited for seven counts of criminal trespass, carrying fines of $35,000 each, and one count of criminal misconduct each, which will cost them another $1,000 each. In talking about the arrests with members of the city council at a meeting Monday, Feb. 6., KPD Chief John Teague said that even those hefty fines didn’t rise to the seriousness of the crime. This is the fourth time in recent years that KPD officers have had to roust squatters from foreclosed homes, but Teague also urged residents to inform the police when they see suspicious activity. “We track a lot of foreclosed homes by working with banks, but we can’t track them all. If you live in a neighborhood with a home like this and you see disreputable things going on, let us know,” Teague said. The non-emergency number for the Keizer Police Department is 503-390-3713.